Passionate music lovers have been searching for quite a while now for ways to compare digital audio-formats. Up to now, it’s been pretty difficult to find recordings from the same source made under standardized conditions using the same, reproducible technology in five different formats. 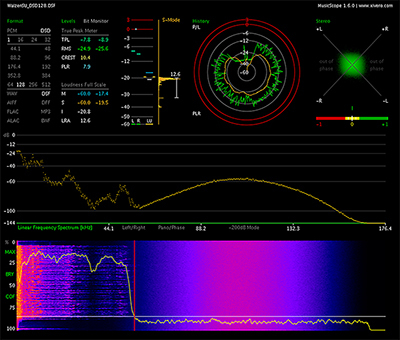 For each recording, we have created a graphic protocol using the audio-analysis tool „musicscope“. This protocol illustrates all relevant audio parameters. We hope that you can gain interesting insights through our listening comparison: TRUST YOUR EARS! Stockfisch publishes these 10 audio files on an USB flash drive. The user will be able to play the files directly from the drive by plugging it into an appropriate Digital-Audio-Player. Or the soundfiles can be transferred to a system fitted with an audiophile HiRes-Software-Player. For our demonstration, we selected a large mechanical 16” cylinder music box and an analog magnetic reel-to-reel tape. Both sources were able to be recorded identically and without losses five times. The 16” cylinder music box generates signals up to 50 kHz at close range. So we decided to use DPA 4041-S microphones that are able to capture such high frequencies. This feature directly contrasts nearly all common studio microphones that stop gently at 20 kHz. The second sound sample originated from an analog reel-to-reel tape. The multi-track recording was made in 1983 on a AEG/TELEFUNKEN M-15A 16-track (2“) (Image 3), the stereo mix was done on a TELEFUNKEN M-15A 2-track (1⁄4“). The guitarist Andreas Rohde is playing his composition „My Uncle Oswald“. By the way, Andreas Rohde's complete album Album "Resonance" was published again in 2016 as part of the Stockfisch-Series „Analog Pearls Vol.2“ als 2-channel SACD-Hybrid (SFR357.4802.2). DSD stereo soundfiles (.dsf) require an USB-Audio-Player with compatible audio drivers capable of playing DSD64 and DSD128 formats. These releases are available for you in our professional online shopping-cart system. Payable with credit-cards or PayPal - of course via safe SSL connection. Normally orders will be dispatched the next working day.